Complete Home Improvement is amongst the leading artificial grass suppliers in Sydney, also facilitating synthetic grass installation service. Artificial grass is a fantastic alternative to natural grass and provides the ultimate lasting solution for a variety of places including schools, playgrounds, sports grounds, as well as, residential and commercial premises. Synthetic or artificial grass needs no watering, so you can save precious water. Artificial turf looks similar to real grass and is lush green. Changing seasons has no impact on synthetic grass; it looks the same year round. Natural grass requires both strong fertilisers and harsh weed-killing chemicals, but synthetic grass is completely free from lead and hazardous chemicals. Artificial Turf is completely safe for children and pets; they are resilient and durable, good to play on, comfy to relax. When you purchase artificial turf in Sydney from Complete Home Improvement, you’ll also get a specialised artificial grass installation service. Complete Home Improvement’s array of premium synthetic grass comes with our promise of quality, thus, we stand behind our products. Artificial grass or synthetic grass is the latest scientific discovery and an alternative to natural grass. Artificial grass is especially helpful for the land that has water scarcity or where grass doesn’t easily grow. Moreover, if you don’t want to be bothered by mowing, watering and edging then synthetic grass is the way to go. Artificial turf is completely hassle-free and above all, you’ll have lush green grass year round. 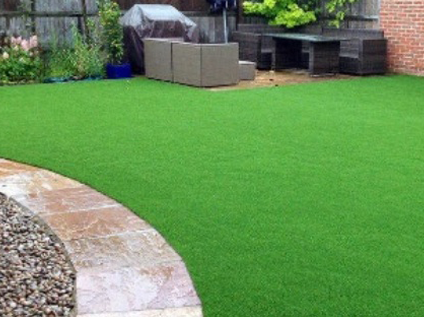 Your experience to sensational artificial grass in Sydney is just a phone call away! Dial 1300 912 293 and the expert and cordial team at Complete Home Improvement will provide you with a professional recommendation for installing the finest synthetic grass that best suits your home or office premises.